"In a world like this, you pay it forward, 'cause more than likely you didn't deserve it when you got it the first time." "It's going to be hard––everything worth doing is." "I’ve been trying to do better about killing people,” Lynn said. “Then fate puts you in my path." Mindi McGinni's books are exactly my flavor of dark, atmospheric and incredibly intelligent. I loved Not A Drop To Drink - it was one of my favorite novels in 2013. 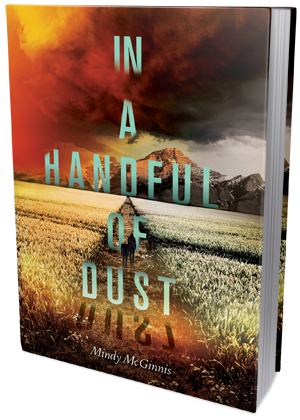 I didn't think Mindy would write a follow-up, but was beyond thrilled to learn about this companion novel. It was just as good (if not better), as Not A Drop To Drink. These two books sport one amazingly gritty atmosphere. What we have here is a world driven to the brink of extinction by its own inhabitants; humans. Almost all of the world's water supply is gone, and whatever little there's left is either protected by the government, or guarded by people who won't hesitate to shoot you if you come to close to their precious water source. But Lynn's little pond is now the source of danger, rather than hope and life. The water is infected and potentially lethal. And so Lynn makes the decision to abandon her childhood home and leave in search of a new place to live - a new home for Lucy and herself. Together, they will journey to California, where desalinization plants are rumored to be purifying water. In A Handful of Dust, to me, is a work of utter brilliance. It's a book so skilfully plotted, so thought-provoking and illuminating, it's not only mesmerizing but also completely breathtaking. Filled with moments of true heartbreak, beautiful and meaningful thoughts and observations, disturbingly vivid portrayals of a world gone oh-so-very-wrong, it's a truly unique and important book. Admittedly, this isn't going to be everyone's cup of tea. I find Mindi McGinni's books to be very different from the mainstream YA dystopians and post-apocalyptic thrillers. You don't read her books for cheap thrills and cheesy forbidden romance, you read them for the slow-burning action, brutality, honesty and cathartic emotional load. They are deeper, darker and more densely plotted than your usual YA. Often times they are even shocking and thoroughly devastating. Most of all, they are smart and insightful, with top-notch character development and world-building. Where Not A Drop To Drink was more about a stationary kind of survival and defending what belongs to you, In A Handful Of Dust is about the challenges of a long and dangerous journey and the hope that lays behind the horizon. I absolutely adored this book. Mindi McGinnis is one of my go-to authors and I know I can't wait for her next book, A Madness So Discreet, to be published.